Truly spectacular views across the North Downs await you when you arrive at Greyfriars House, for this 19th Century mansion is set on a fifty foot high cliff. The extensive lawn area is level with the tree tops some forty feet below, offering a breathtaking view over the peaceful Surrey countryside. A wedding held here would undoubtedly be a talking point for years to come as well as forming the backdrop for captivating wedding photography. 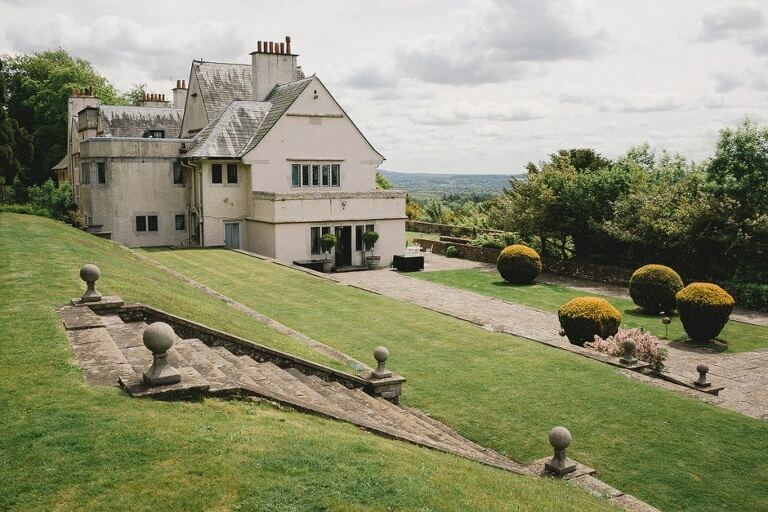 Greyfriars House itself dates back to 1896 when the owner of the estate, playwright Julian Sturgis, commissioned Voysey to design and build a mansion contoured into the steep Surrey hillside. Today, the home is a Grade II Listed building retaining many of its original features. Notice the heart shaped motifs – letterbox, door hinges, locks and keys – a signature mark of Voysey’s architecture, but also a unique romantic touch for a fairytale wedding. This venue is licenced for civil ceremonies and partnerships for up to 96 seated guests and up to 130 for evening events. The lavish Drawing Room with its beautiful large stone mullioned bay window, twin stone fireplaces at either end, traditional high vaulted ceilings and access onto the lawn areas makes a delightful setting for ceremonies and wedding breakfasts. Alternatively, for smaller wedding parties, the Bar, a traditional wood panelled room with its large carved wooden fireplace focal point, bar area and access onto the external grounds would give a more intimate and homely feel. Exclusive use of the Main Lawn and Terraced Garden is included, allowing extra space for marquees and for guests to relax, enjoy refreshments and take in the stunning panoramic scenes. The Terraced Garden itself is a registered ‘historic garden,’ and has recently been restored to former glory with stone staircases, ornamental topiary and a square fountained water feature with koi carp. This wonderfully tranquil environment complete with treetop level location, provides unequalled opportunities to capture breathtaking photographic images and personal wedding day shots. The current owners of this venue pride themselves on their flexible nature and ability to create tailor made wedding day packages designed to specific requirements. Resident caterers with established industry reputations are on hand to discuss and create delicious menus to appeal to all age groups, budgets and dietary need complemented with a vast selection of wines produced from local vineyards. Wedding planners are happy to advise on co-ordinating themes, products and services to eliminate any wedding day worries and guarantee your special day runs to clockwork. Whilst an exclusive wedding venue, is also a family home and as such is unable to provide accommodation for wedding parties apart from spacious preparation and changing facilities for the bridal couple. However, by prior arrangement a shuttle service is provided to and from Guildford town centre and station two miles away. The nearby towns of both Guildford and Farnham do provide a wide selection of hotels, guest houses and bed & breakfast accommodation for guests, enabling them to enjoy a longer break to fully appreciate the picturesque scenery of both the local surroundings and Greyfriars House. The Hogs Back, Puttenham, Guildford GU3 1AD. If you’d like to enquire about my availability for Greyfriars House please get in touch here.